Drug factoryAnnual drug sales in China is estimated at $13.6 billion. Chinese drug companies market drugs through networks of wholesalers and pharmacies that exist in each province and major city. Many offer incentives to doctors to prescribe their drugs. Hospitals sell 80 percent of pharmaceuticals. Drug makers win contracts through competitive bidding. Hisun Pharmaceutical is one of China’s largest drug makers. A small state-owned company that grew quickly into a large conglomerate, it exports a number of drugs approved by the United States Food and Drug Administration but also has produced toxic chemicals that have killed its workers and fouled the cities---Taizhou in Zhejiang---it is based. In one case workers died on two successive nights from breathing chemical-laden air after they were ordered to crawl inside and check a pipe used to dump waste into the sea. China wants to attract world-class pharmaceutical laboratories. To get them to come the Chinese government is offering cheap clinical trials. Clinical trials are among the biggest costs for drug companies. Swiss-based Novartis, Britain’s GlaxoSmithKline and the U.S.’s Eli. Lilly are among the companies that have taken up the offer and invested of over $100 million in China. Western drug companies that have entered the Chinese market include Pfizer, GlaxoSmithKline, Johnson & Johnson and Sanofi-Aventis. Among the drugs they sell in China are Johnson & Johnson’s Sudafed, Sanofi-Aventis’s sleeping pill Ambien and Pfizer’s cholesterol medicine Lipitor. The major American and European drug companies have spent over $1 billion in China over a 15 year period, hiring sales representatives and providing doctors with research grants and free trips. GlaxoSmithKline and others have plants in China. Western drugs have had tough time breaking into the Chinese market even though they have medicines that could save and improve the lives of millions. One of the main obstacles is a preference for Chinese medicine and a prejudice for Western medicine. Even Chinese that drink Starbuck’s coffee and drive Buicks prefer herbs and acupuncture to foreign cold medicines and sleeping pills. The foreign companies also have to overcome government price controls, a ban on consumer advertising for prescription drugs and drugs by Chinese rivals that often win out in competitive bidding because they are cheaper. China's vaccine-making prowess captured world attention in 2009 when one of its companies developed the first effective vaccine against swine flu---in just 87 days---as the new virus swept the globe. In the past, new vaccine developments had usually been won by the U.S. and Europe. Then, in March 2011 the World Health Organization announced that China's drug safety authority meets international standards for vaccine regulation. It opened the doors for Chinese vaccines to be submitted for WHO approval so they can be bought by U.N. agencies and the GAVI Alliance. "China is a vaccine-producing power" with more than 30 companies that have an annual production capacity of nearly 1 billion doses---the largest in the world, the country's State Food and Drug Administration told The Associated Press. But more needs to be done to build confidence in Chinese vaccines overseas, said Helen Yang of Sinovac, the NASDAQ-listed Chinese biotech firm that rapidly developed the H1N1 swine flu vaccine. "We think the main obstacle is that we have the name of 'made in China' still. That is an issue." First up is likely to be a homegrown vaccine for Japanese encephalitis, a mosquito-borne disease that can cause seizures, paralysis and death. The vaccine has been used for two decades in China with fewer side effects than other versions. Its manufacturer expects WHO approval for it in about a year. Also in the works are vaccines for polio and diseases that are the top two killers of children---pneumonia and rotavirus, which causes diarrhea. While welcoming WHO's approval of China's drug safety authority, one expert said it takes more than a regulatory agency to keep drugmakers from cutting corners or producing fakes. "In the U.S., we have supporting institutions such as the market economy, democracy, media monitoring, civil society, as well as a well-developed business ethics code, but these are all still pretty much absent in China," said Yanzhong Huang, a China health expert at the Council on Foreign Relations. "For China, the challenge is much greater in building a strong, robust regulative capacity." Last year, a Chinese newspaper report linked improperly stored vaccines to four children's deaths in northern Shanxi province, raising nationwide concern. The Health Ministry said the vaccines did not cause the deaths, but some remained skeptical. Meanwhile, Chinese researchers reported in the New England Journal of Medicine earlier this year that a pandemic flu vaccine given to 90 million people in 2009 was safe. WHO's medical officer for immunization, Dr. Yvan Hutin, said WHO's approval of the Chinese drug regulatory agency is not "a blank check." Each vaccine will be evaluated rigorously, with WHO and Chinese inspectors given access to vaccine plants on top of other safety checks, he said. For China, the next few years will be crucial, as biotech companies upgrade their facilities and improve procedures to meet the safety and quality standards---a process that is expected to be costly and challenging. Then they will submit vaccines to the U.N. health agency for approval, which could take a couple of years. Worldwide, vaccine sales last year grew 14 percent to $25.3 billion, according to healthcare market research firm Kalorama Information, as drugmakers which face intensifying competition from generic drugs now see vaccines as key areas of growth, particularly in Latin America, China and India. China's vaccine makers, some of whom already export in small amounts, are confident they will soon become big players in the field. "I personally predict that in the next five to 10 years, China will become a very important vaccine manufacture base in the world," said Wu Yonglin, vice president of the state-owned China National Biotec Group, the country's largest biological products maker that has been producing China's encephalitis vaccine since 1989. CNBG will invest more than 10 billion yuan ($1.5 billion) between now and 2015 to improve its facilities and systems to meet WHO requirements, Wu said. The company also intends to submit vaccines to fight rotavirus, which kills half a million kids annually, and polio for WHO approval. Smaller, private companies are also positioning themselves for the global market. Sinovac is now testing a new vaccine for enterovirus 71, which causes severe hand, foot and mouth disease among children in China and other Asian countries. It is also preparing for clinical trials on a pneumococcal vaccine Yang says could rival Pfizer's Prevnar, which was the top-selling vaccine worldwide last year with sales of about $3.7 billion. Pneumococcal disease causes meningitis, pneumonia and ear infection. "In the short term, everyone sees the exporting opportunities, because outside of China the entire vaccine market still seems to be monopolized by a few Big Pharma (companies)," Yang said. The entry of Chinese companies is expected to further pressure Western pharmaceutical companies to lower prices. Earlier this year, UNICEF's move to publicize what drugmakers charge it for vaccines showed that Western drugmakers often charged the agency double what companies in India and Indonesia do. The aid group Doctors Without Borders criticized the vaccine body GAVI for spending hundreds of millions of dollars on anti-pneumonia vaccines from Western companies, saying it could put its buying power to even better use by fostering competition from emerging manufacturers like those in China. GAVI's Schwalbe said the vaccine body has to buy what is available and negotiates hard for steep discounts. "We need to buy vaccines now to save children's lives now. We can't wait." In Panama 174 people were poisoned, 115 of them fatally, with others disabled, after taking a Chinese-made cough medicine contaminated with diethylene glycol (DEG), a poisonous chemical often found in solvents and antifreeze. The deaths were blamed on mislabeling---the cough medicine labels said the medicine contained glycerin, a safe sweetener, not DEG. After the news was revealed further digging revealed the presence of DEG in toothpaste sold around the globe (See Unsafe Toothpaste, Food) and that fake glycerin produced by a state-owned company in China killed nearly 100 children in Haiti. In September 2007, methotrexate and cytarabin---two medicines used to treat leukemia and rheumatoid arthritis---were recalled after being linked to adverse reactions in several young leukemia patients in Guangxi autonomous region in southern China. Some patients complained of pain. Others had difficulty walking after being injected with the drug. The five main agencies in charge of food and drug safety fight among themselves and suffer from a lack of personal and equipment. Whistle blowers, even individuals who post whistleblower messages on the Internet, end up in jail. The substance used the Baxter heparin---an inexpensive, unapproved chemical called chondroitin sulfate, used to treat joint pain, altered to mimic the real active ingredient in heparin---was made by a Chinese company called Changzhou SP, which in turn bought its heparin from companies that gather crude heparin form pig intestines. Evidence seems to indicate intentional counterfeiting. The active ingredient in heparin and the substitute can be uncovered with special tests using magnetic resonance equipment. Such tests determined that up to 50 percent of the active ingredient in the heparin was a mimic heparin. The substitute seems to have been added as a cheap filler. Some have speculated that the fake ingredient may have been substituted because an outbreak of pig disease had dried up the supply of pig intestine Chondroiton sulfate, which can be obtained from pig cartilage and costs about out one twentieth the price of heparin to produce. An official at Baxter said that it appeared the heparin produced in China had been deliberately contaminated. The industry which revolves around pig farmers that supply the intestines and processors that make crude heparin are not regulated and have little oversight. Most facilities have never been inspected. Tainted toothpaste imported from China has turned up in the United States, Panama, the Dominican Republic and Australia. The FDA in United States, after being alerted by officials in Panama, issued a warning on more than a dizen brands of toothpaste manufactured in China, including Mr. Cool. Everfresh Smile-2, Superdent and Springfresh, some of which sold for as little as nine cents a tube wholesale. Some tubes of Springfresh contained 6 percent DEG. Manufacturers had substituted DEG for a more expensive sweeteners such glycerin which is used in U.S.-made toothpaste as a sweetener and a bonding agent. Chinese customs found the DEG in the toothpaste but did not regard it as dangerous and let it pass. DEG was banned in the United States in 1937 after 105 people died taking a medicine in which it was one of the ingredients. Even so it is not banned in China. There are over major 5,000 drug makers and of thousands more small, unregulated drug and drug ingredient producers. Some companies routinely substitute fake or substandard ingredients. Others bribe officials and submit false information to get their drugs approved. Zheng Xiaoyu, former head of the SFDA, was executed in 2007 for accepting $850,000 in bribes in exchange for granting approval for hundreds of medicines, some later found to be dangerous (See Below). The Chinese drug industry is poorly regulated. It is hard to keep a watch on all of the drug makers and producers. Safety regulators are governed by bosses who often respond more to their own agenda than to rules and regulations they are supposed to enforce and are susceptible to bribes from the people they are supposed to watch over. One of the problem is there is virtually no regulation in the drug ingredient industry, where many of the problems originate. Some of the ingredient makers export steroids and human growth hormone used in illegal performance-enhancing drugs used by athletes. Others make counterfeit ingredients that are put unknowingly into drugs. Unlike drug companies they are not regulated by the food and drug and agency. They also are not regulated by other agencies that keep watch on chemical companies that produce things like solvents and fertilizers. Many drug ingredients are produced by chemical companies that are neither certified or inspected. These companies make ingredients that are used by Chinese drug makers and are exported to foreign drug makers. Because there are few laws and regulations in their sector there is little to stop from exporting unapproved doctored or counterfeit ingredients. In some cases they have passed off poison as legitimate ingredients (See Pet Food and Toothpaste, Food). Among the Chinese chemical makers investigated by the New York Times that produced questionable drugs are Honor International, which shipped counterfeit Viagra labeled as “grape seed extract” to the United States; Orient Pacific International, whose owner was arrested in Houston for selling counterfeit dugs for prostrate cancer, Alzheimer’s disease and schizophrenia; GeneSciense Pharmaceutical, indicted on charges of smuggling and illegally selling human growth hormone; and CNSC, the source of ingredient that killed or disabled 139 Panamanians. All of these companies were present at an exhibition for drug ingredient makers in Milan in 2007. A government watchdog agency revoked the production licenses of five drug manufacturers in 2006 and 2007 and withdrew good manufacturing practice certificates from 128 others. Among the companies that were shut down were Qiqihar No.2 Pharmaceutical Co, following the deaths of 11 people who took a drug it manufactured. The company said that it traced the poisonous ingredient to a chemical supplier that substituted a less-expensive but dangerous agent for an inactive ingredient in the drug. Taixing Glyercin Fatcory, the source of much of the DEG, was also shut down. It was charged with fraudulently passing off DEG as glycerin. Xuzhou Anying Biologic technology and Binzhou Futian Biology Technology, the sources of melamine found in some of the pet food, had their licenses revoked. In July, 2007, China’s top food and health official, Zheng Xiaoyu, was executed on corruption charges in connection with taking $850,000 in bribes from eight companies in return for approving untested drugs. He was executed within a few weeks of when a court handed down his death sentence. The swift move was largely seen as both an effort to reassure the international community that China was serious about tackling safety issues and an example of “slaughtering the chicken to warn the monkey” to keep other officials in line. It was the first time an official of such a high tank had been executed since 2000. Zheng’s execution was popular among ordinary Chinese. In July 2007, one of Zheng’s assistants Gao Zicheng was sentenced to death with a two year reprieve, a sentence which usually is commuted to life in prison, for accepting bribes totaling $307,000 from two drug companies. He oversaw a pharmaceutical registration agency accused of approving substandard medicines, including an antibiotics blamed for at least 10 deatha. Fake medicine is a serious problem in China. In some Chinese cities as much as 40 percent of all the drugs sold are counterfeit. They include antibiotic made with talcum power and birth control pills filled with rice flour. Six different version of knock-off Viagra are available in some airport drugstores. China is believed to be the source of many of the fake medicines sold around the globe. Counterfeit drugs made in China have turned up in almost every country. Many of the fake drugs sold over the Internet are produced in China or are made with ingredients produced in China. By one estimate 200,000 people die each year in China from taking fake drugs. Some are unauthorized copies. Others are made with substandard ingredients. Yet others are made with ingredients that do nothing or are even harmful to users. Many people are involved in the trade. The sentences for getting caught are relatively light. Some counterfeit drugs are made by illegal labs. Others are made legal labs and legitimate drug companies. Yet others are made by legal labs and legitimate drug companies using counterfeit ingredients. It is often not clear whether these labs and companies knowingly or unknowingly use the counterfeit ingredients. In 2001, 1,300 drug-counterfeiting factories were shut down and 480,000 cases of fake drugs was investigated. Many of the factories reopened somewhere else. Owners are often tipped off about investigations by police who are bribed by them. 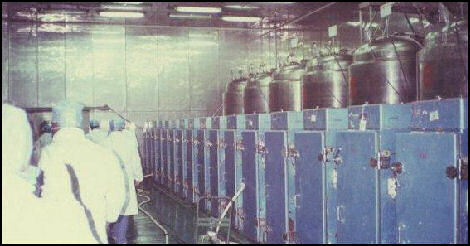 Much of the work in locating the factories being done to by private investigators hired by the drug companies. In May 2006, 13 people died in Guangzhou after being injected with a fake medicine. A few months later 10 more people died in similar fashion in Anhui Province. 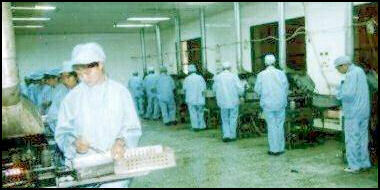 In May 2008 a factory producing fake medicine was found inside a hospital in Beijing. Patients were given fake medicines that was said to cure everything from hepatitis to mental illness. Patients paid around $1,000 for treatment with the drugs which hospital officials said would cure them. In Japan in 2001 and 2002, hundred of people became sick and four people died from liver problems after taking Chinese-made diet pills purchased over the Internet. The pills escaped regulators scrutiny by being classified as a diet aid rather a drug. One woman told Reuters that after she took the controversial diet pills said she quickly lost weight after taking them, b ut not long afterwards she started to feel lethargic and nauseous. She was convinced that she might have died if she had been warned that they were dangerous. The government also announced cracked down on criminal rings that ran huge manufacturing centers that produced everything from fake Viagra to counterfeit Tamiflu, and anti-malaria drugs to imitation Crest toothpaste. In November 2011, authorities busted a gang that produced and sold fake medicine---some made of animal feed---arresting 114 suspects and seizing more than 65 million counterfeit tablets. People drink heated apple vinegar to clean the stomach. In the 1960s, million of people went to hospitals to get injections of chicken blood extract in hopes that it would extend their lives. People with spinal chord injuries are sometimes treated with the mucous cells from aborted fetuses. In the treatments patients are injected with cultured cells---collected from the noses of the fetuses---into an area around the injured areas of patients with spinal chord lesions. Although the legality and effectiveness of such transplants have not been worked out doctors who do the treatments claim they helps regenerate nerve cells of the spinal chord and help patients regain some feeling and movement. The procedure is carried out by a doctor at the Medical Science Hospital in Beijing. Many foreigners with spinal injuries travel to Beijing for the treatments. Urine is collected for medicinal uses and fertilizer in 65-gallon drums. . Theroux saw a sign over a urinal at a public restroom that read "We would like good quality urine, so please do not put anything in---no spitting, no paper, no cigarette butts."